It was early in 2007 when I first decided to pursue a dream of playing golf in all 50 states. I think the idea was first inspired after looking at Golf Magazine’s bi-annual “Top 100 You Can Play in the U.S.” and noticing how many states were represented on that list. At first, I thought it would be cool to try and play all 100 of those courses, but that concept quickly morphed into 50 states. To commemorate that first adventure and chronicle my ultimate 50-state goal, I brought one special golf ball along with me. Now, it wasn’t special when it started (just your average Titleist NXT Tour fresh out of the box), but it has since become very meaningful to me. I determined that this ball would be played on at least one hole in all 50 states. On that first road trip, I used that ball for one hole on each course that I played. Since day one I’ve known I would be extremely devastated if I were to ever lose that ball during the course of play, so picking the right holes has always been of vital importance. Generally, its been on par-3 holes with the least amount of trouble to get into—no big water hazards, O.B. area, or big bushes/trees/tall grass that might eat up my beloved ball—but every once in awhile a short par-4. As soon as I was on the tee of a hole that appeared to be super “safe” I’d pull out the special ball! And once I would complete my round, I would add that state in Sharpie to the ball. The ball went with me later that year when I played in Maine and New Hampshire. Unfortunately, I didn’t play as much golf in the following few years, but last year I renewed my dream and have been gladly pursuing it once again. Of course, I used the ball when I visited Florida, Georgia and South Carolina late last year and I will certainly have it with me over the next week and a half as I drive throughout the Southwest and Midwest states. 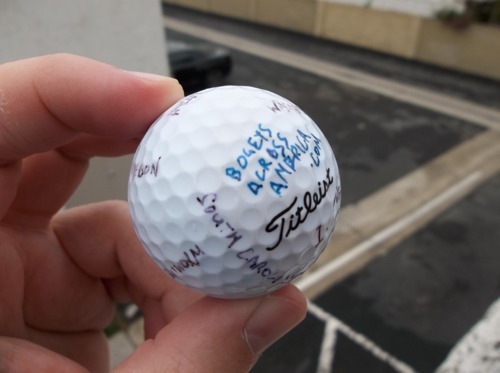 I just recently added the BogeysAcrossAmerica.com name to the ball, so it’s officially tied in with the Golf Nomad blog. Currently, there are 13 states and 2 provinces listed on the ball. I have actually played 14 states, but I had played in Arizona prior to having this special ball, so I will be using it in AZ this Friday as I play the first round of my trip in Scottsdale. When this trip is over, I hope to have Arizona, New Mexico, Texas, Oklahoma, Missouri, Kansas, Nebraska and Colorado freshly inscribed onto the ball. If weather permits and the road trip goes as planned (not much room for error on this one), I’ll be able to add those seven new states to my list. It should be a fun adventure and I plan to try and post stories and pictures nightly from the road, so stay tuned to the Golf Nomad blog from Friday, May 4 through Saturday, May 12 as I continue my “Bogeys Across America” tour!